I just checked the Lemke page as the Kato/Lemke ICE-4 wasn’t announced for the December release as promised (end of 2018). Lemke are now giving August 2019 as a release date. This thread should probably be stickied btw! Generally, they take pre-orders as soon as products are announced. As was the case with ICE 3 models. But I never pre-order european models (except cheap fleischmann cars) as it can be cheaper to wait and compare store prices. Probably because people in Germany/Netherlands are more interested in having DCC with sound? Or perhaps decoders are easier to get in Netherlands and Germany compared to Spain? I think it is quite easy to equip a decoder in the analogue version. Also FYI EU retailers expect the Arnold ICE DB/NS/Renfe to be released around February 2019. These are all goods cars, by the way. But isn't all of Arnold's stuff produced in China? I think so. But there are multiple model train manufacturers in China that produce model trains for a variety of brands. One major one closed recently quite abruptly, which caused a lot of turmoil for US brands that use it; many US brand trains have cancelled models. I was hoping that european brands were not affected, which seems to be the case, except for Arnold who just announced this yesterday. There are other factories in China which are expected to take over the manufacturing of these models, but it cannot be done without severe delays, necessitating some brands to just cancel their models and focus on popular ones. LEMKE annouced new stuff today as "Autumn Highlights 2018". So we can expect them in 2020 or so? Who knows. - Hobbytrain 23484 SBB Silowagen "HOLCIM"
Personally looking forward to the 150 Jahre Brennerbahn zebra locomotive, already saw it in HO (in a Youtube video) and I think it looks amazing. I'm quite surprised that they decided to release the National Express 110+the train set for it, I hope it won't be too expensive. Been seeing and riding on this set regularly in the recent time. 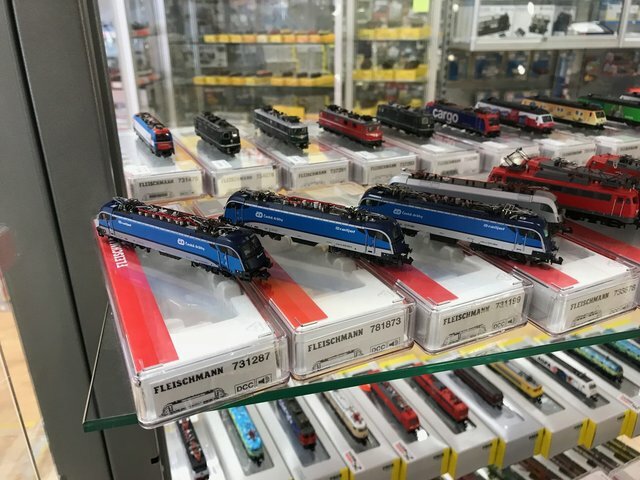 I wonder what "white" color the Fleischmann CD Vectron and cars will have, and how they compare with the Hobbytrain versions. The ICE-1 is tempting. That was the first high speed train I every saw. It's a bit pricey though. It is still a whopping 269 euro cheaper than the minitrix version that's coming out (full set price). Though the minitrix version does have interior lighting built in and a name. I don't see the minitrix ICE on their website. Do you have a link. With four companies (allegedly, yes I mean Lemke/Kato) coming out with ICE versions, I'll have to be careful or I'll end up going from zero to four ICE trains in the span of one year. (mini)Trix 16941 (base set) and 15941 (expansion set). Prototypical combination is 14 cars (powercars included). Due to go on shelves any day now, according to retailers. But (mini)Trix is very good at announcing stuff rather than actually releasing stuff. On other related news, Minitrix Rheingold BR101 exclusive edition 16082 is also about to be released any day now (my vendor said this week, even). (mini)Trix 16941﻿ (base set) and 15941 (expansion set). Prototypical combination is 14 cars (powercars included). Due to go on shelves any day now, according to retailers. But (mini)Trix is very good at announcing stuff rather than actually releasing stuff. On other related news, Minitrix Rheingold BR101 exclusive edition 16082﻿ is also about to be released any day now (my vendor said this week, even). Thanks for the info Yavianice. Both the miniTrix and Fleischmann sets are nice. I wish that they didn't come with DCC already installed. I've had bad experiences with Fleischmann decoders on a Digitrax system. I don't know what decoders Trix use but I don't really care too much about sound in general. Fleischmann usually sells a separate options for with/without DCC. Pity they don't seem to be doing that here. The Rheingold is beautiful, I agree. Thanks for the info Yavianice. Both the miniTrix and Fleischmann sets are nice. I wish that they didn't come with DCC already installed. I've had bad experiences with Fleischmann decoders on a Digitrax system. I don't know what decoders Trix use but I don't really care too much about sound in general. Fleischmann usually sells a separate options for with/without DCC. Minitrix nowadays only sells DCC, since they are part of Marklin, and therefore assume everyone has (or should have) DCC. But all new releases come with a proprietary analogue bridge, which, depending on which way you insert it, allows you to turn specific functions (mostly lights, though) on or off. It's just a bummer that if you want the DC version, you pay the DCC premium anyway. I actually want DCC. But Fleischmann decoders don't work well with many non-European DCC systems. So, unfortunately I'd be buying the motor and function decoders (at inflated prices) then removing them and replacing them with different decoders. Oh sorry, I misread your comment. I should stop posting in the middle of the night. While I should be working. Just curious, which DCC decoders do you switch to? And I think that modern Fleischmann models are just the digital versions with an analogue bridge, which you can remove and then replace with a decoder. That was at least the case with my BR 120 (which is undergoing top secret modifications). I'd have to check, but I think I changed to some Digitrax decoders. The Fleischmann decoders won't work on a Digitrax system at the regular N-scale voltage. They only work on HO voltage. I had a thread about it open for a while. It was believed (explanation from kvp that I can't do justice to) that the problem was caused by the Fleischmann decoders feature that allows it to run on either DC or DCC. The low US nscale voltage confuses it. You're supposed to be able to turn this feature off by changing the CVs. However, the decoder won't accept the change. So the choice was to run it at high voltage or change the decoders. I chose the latter. The Novegro Hobby Model Expo (commonly shortened to HME), is Italy's largest and most important yearly (evry last weekend of september) model exibition & marketplace and the second biggest in Europe, behind Nuremberg's Toy Fair. I went there with a few friends on their last day, september the 29th. The day starts at my local station, as we're greeted by italy's most common locomotive, the E464 hauling the boring Vivalto double-decker IR coaches (photo taken at Lambrate station), here in Trenord colors as it's Lombardy's regional railway company. Right after the entrance, there was the Honrby stand, with it's acquired brands: Electrotren (Spanish H0), Lima (resonably priced Italian H0), Rivarossi (less reasonably-priced italian H0) here with UIC type Y coaches and E656 and E645 electric locomotives and Arnold (German and elsewhere N, here with a DR V60 shunter, a BR 187 loco and the Italy-Switzerland Cisalpino train). The Piko stand had quite the variety of things from the G-scale DB cargo BR 232 "Ludmilla" and bundesbahn V60 shunter to the N scale DB Regio Stadler electric GTW-2/6 and MaK G1206, (not exactly) local stuff in H0 such as the Iseo line ATR 125 (wich is a Stadler GTW) and the Ferrovie Padane (Padanian Railways) D220 and D221 (bought second-hand from DB in the 1980s). The LGB stand with the obligatory Rhaetian Railways stock, Ge 4/4 and Tm III and a snowy display layout, again, with RhB models. Marklin had a demonstrator layout for their mobile-station system and a "MyWorld" toy layout. The ACME stand. After the demise of the Rivarossi and Lima brands in the early '2000s, ACME quickly rose to be one of the three new leading italian model train makers. Displayed were E633, E656, E403 and E402B (in frecciabianca colors) electric locomotives. Os.Kar is a sardinian-based model train maufacturer (and the last of the three), known for it's nice models of 1960's diesel locos and DMUs. The absolute surprise of this year was a long "hoped" model, the ALe 642 of the G.A.I. family of EMUs (Ale 724, ALe 582, ALe 642), wich were immediatly being sold for quite a lot: 318€ the 3-car set, 375€ the 4-car set. The "Jelly Models" stand, they are an extremely recent company (been around for a couple years or so) that specializes in commercializing H0e/H0m narrow gauge models, based on Tomytec's Hakotetsu chassis. Some are even very distinctive Japanese-looking (that's Tomix finetrack under there!) running on weird, tortuous and extremely compact layouts (the "one" on the left uses a single Kato flexible track, whose lenght is exactly 808mm). N3C is another artisanal manufacturer, specialized in busses, trolleyubsses and trams of Milan's municipal transportation company (ATM). Their Milan Metro Line 1 200 series (4th batch - 1976) is the first ever commercially avaible italian subway train. UTECA-Mfal is a manufacturer known for it's extremely detailed (and expensive) brass models. They were present with a selection of 1920's passenger coaches and 1950's freight cars, ALe 841 regional trains (rebuilt in the 1980s from ALe 601 express EMUs), the Breda TEE DMU and the FNM (Ferrovie Nord Milano - Northern Milan Railways, merged with Trenitalia to form Trenord in 2011) EB730 EMUs from the late 1940s. Pi.Ra.Ta. "graduated" a couple of years ago from artisanal to semi-industrial model manufacturing with it's TEE Gran Confort coaches and nowdays they offer also the 1980's "Bandiera" cream-black with red lines colors and the early-2000s XMPR liviery. They've also started making the UIC type Z coaches in "Euro" C1 orange. Hobbytrain (european Kato distributor) was also present inside the Pi.Ra.Ta. stand, with quite a vast selection of unitrak and unitram, altough there was absolutely no Japanese rolling stock (except for the snowplough DD16 set hidden in a corner, wich sold for double it's price at HobbySearch). The only Kato trains present were the Rhaetian railway Allegra and the TGV Résau. LoCo, these are artisanal-made italian N gauge models. Each car sells for around 150€. Then if you'd like to make a real-lenght train with these Trenord rebuilt "piano ribassato" coaches (7/8 coaches + loco per train) be prepared to save a lot! Fratrix stand, these are also artisanal-made N gauge models but way more expensive than LoCo (around 200€). Many individual sellers were also present, some had also american models on display such as the massive Union Pacific Gas Turbine loco and the Metroliner in Amtrak's phase 1 colors.